Welcome to the first Live Events Dev Blog! Over the past few months, the Live Events team have been hard at work on various projects - ones that change up the playing field for Treasure Hunter and more. We've identified areas in which we can increase the value of what you get when playing whilst also offering a larger variety of both offers and more – so that's what we'll be discussing in this first blog! We plan on bringing these out more frequently when the team have significant progress we want to update you on, so keep your eye out on the forums for any updates we may have. To start with, we wanted to give an update on Treasure Hunter 2, which we mentioned had been started back in 2017. After a great deal of work on this project, it became apparent that what we were working to provide wasn't what you, the community, had wanted. After much too-ing and fro-ing, we decided that it would be best to take a different route entirely. As such, TH2 is no longer in active development. So, what does that mean for the Live Events team and what we're working on? For us, TH should always feel like a benefit when used, and we feel that the value of what it offers needs to be addressed properly. Recently we've been bringing back and testing various different promotions and initiatives in Treasure Hunter. We've recently been offering people the chance to earn oddments in store instead of cashing out prizes. In June, we brought back to run alongside other promotions this month to see how people used it in a longer term. It's gone well, so we're looking to bring this in as a permanent feature. However instead of using oddments, we're looking at ways we can revitalise a currency already in place – Hearts of Ice. HoI currently require a lot of management to provide any real value. We want to make this easier and provide more meaningful benefits within Treasure Hunter. Being able to directly purchase various items, reroll unwanted prizes or boost charges in promotions such as Gemerator are all things we're currently looking to add. The base reward selection of Treasure Hunter has become a little stale over time. There are undesirable prizes and old filler items that don't feel rewarding or interesting to earn. We're now looking to give the reward base of Treasure Hunter a complete overhaul – rebalancing the earnable rewards to things much more interesting and desirable. In July, we will be introducing a Daily Key booster, allowing you to increase the number of daily keys you receive when logging into the game. For a small price, players will receive double their normal daily keys allowance for 30 days. Whether as a Free Player jumping from 1 to 2 keys a day, or a Premier Club member jumping from 3 to 6, this will provide everyone with great value. Our long-term goal is a greater focus on cosmetics and content engagement. We've been experimenting with cosmetic only promotions and testing the limits of our limited-time in game events, however feel this is something we can take further. Inspired by other games, next week, we'll be implementing Runepass – a pilot event in which you'll be able to earn items through playing the game. With two prize tracks, you can either play along the free path, or pay a small price to access the Golden Track, which provides you with a larger number of prizes and more cosmetics. Runepass comes with a variety of challenges and tasks in order for you to progress through its levels, whilst also awarding you with progress for simply earning XP in any part of the game. A player of any calibre will be able to take part and earn levels, although if you want access to those top-level rewards, you'll want to make sure you're completing the challenges the RunePass throws your way! 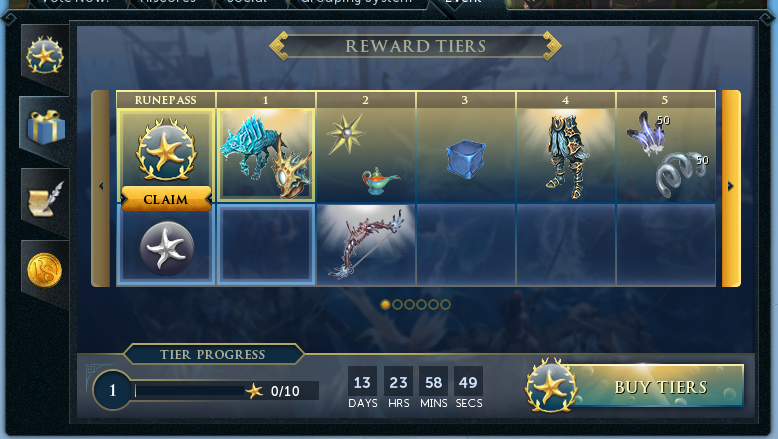 You'll be able to access our first Runepass next week and make all your progress until Sunday 15th July. This two-week event acts as a trial, to which we'll collect feedback and monitor how people play, before deciding on whether or not we'll pursue it as a larger project. One of the frustrations we regularly feel from players is the inconsistent approach to how we make items available throughout the game. We are sitting on a vast back catalogue of items that Treasure Hunter (and Squeal of Fortune) which players can no longer obtain. Many that have otherwise been lost to time – outfits that were unfinished, cosmetics unobtained. This we want to change. We have started work on a new lifecycle plan for all items. This new system will mean that every old, current or future item will follow a consistent lifecycle moving from being exclusively available via Treasure Hunter all the way through to being available to Free players. This is the approach we are already taking with certain other TH items, but will now apply to our entire back catalogue of TH items. In the future, it will be up to you when you want to access a bit of content, rather than missing out completely. This blog is the first step in a larger effort to talk to you about our plans more. Last week we ran our first Live Events Forum Q+A, and in the near future, we'll be reinstating the Live Events showcases, in which our mods will be in game to show off their work, as well as give you an opportunity to chat with them directly. Expect a stronger presence on the RS Live Events twitter account, and potentially a dedicated server on the Official RS Discord to chat more directly with the community. And that as they say, is that! Over the following weeks, we'll be getting an active calendar of our communications out to you so that you can see when we'll be striking some news next, or actively engaging with the community. In-between you can always find myself on twitter @JagexSayln, or tweet our team specific account - @RSLiveEvents. Thanks for reading, and I look forward to giving you the next dev blog soon! Any update on the loyalty points rework, which has apparently also been shelved for the time being? This was tackled in our Forum Q+A last week - at the moment we're currently focusing on other projects that need our time and attention. We are aware it's something the community are desperate to get changed though, and we're looking at different methods we could change it. When we have something to share with you all regarding it, we will. But don't expect it in the near future. This was tackled in our Forum Q+A last week - at the moment we're currently focusing on other projects that need our time and attention. We are aware it's something the community are desperate to get changed tough, and we're looking at different methods we could change it. I'm quite sad to hear that, it's a real pain for me and others currently to have to work around auras in order to PVM. On the topic of communication, I really dislike how the previous QA was locked when there was discussion still to be had. It would seem to go into the realm on censorship on such controversial issues which is not something you want to be doing. It is things like this which make me prefer to use Reddit and Twitter to discuss the game rather than the forums. "Oddments store now available on a permanent basis"
"One of the frustrations we regularly feel from players is the inconsistent approach to how we make items available throughout the game. We are sitting on a vast back catalogue of items that Treasure Hunter (and Squeal of Fortune) which players can no longer obtain. Many that have otherwise been lost to time – outfits that were unfinished, cosmetics unobtained. This we want to change. We have started work on a new lifecycle plan for all items." Finally. My feedback is being heard. I'm not sure I fully understand what's being changed a lot of our main concerns were the broken promos, and new promos getting added being more and more overpowered. another problem is how many promos we have been getting we are back to no break between promos and no time with no new promo. you're giving us more keys and constantly pushing more treasure hunter in our face. it is rather broken being able to max from keys or get a massive 200m drop, or with some promos multiple 200m drops at once leading anywhere to over 1b. Glad to see this and hopefully it works out well. Understandable - we work to a priority style list to make sure we're tackling things that need to be tackled first. LP is on that list, and we will get around to it when the time is right. The QA was locked purely because we had set a certain amount of time aside for the Q+A session. Mod Kalaya is only able to put so much time aside in order to answer questions, and if left open, she wouldn't have been able to get back to those that kept coming in. We're not trying to kill conversation, only manage expectations as to not leave players hanging. Yep, also one step closer to my dream "goal" as well.